Enjoy all the modern comforts in the heart of Lincoln Park! 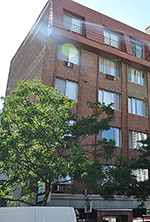 Located near Fullerton on Clark Street, 2424 sits in the center of one of Chicago's finest neighborhoods, Lincoln Park. Residents of 2424 find an almost endless number of restaurants, services and entertainment spots, as well as the Lincoln Park Zoo, all within walking distance. This contemporary six-story mid-rise contains 100 updated studio and one-bedroom apartments. The building is recent construction and provides many modern amenities for a comfortable living experience including parking, spacious apartments with modern kitchens and very cool air conditioning.